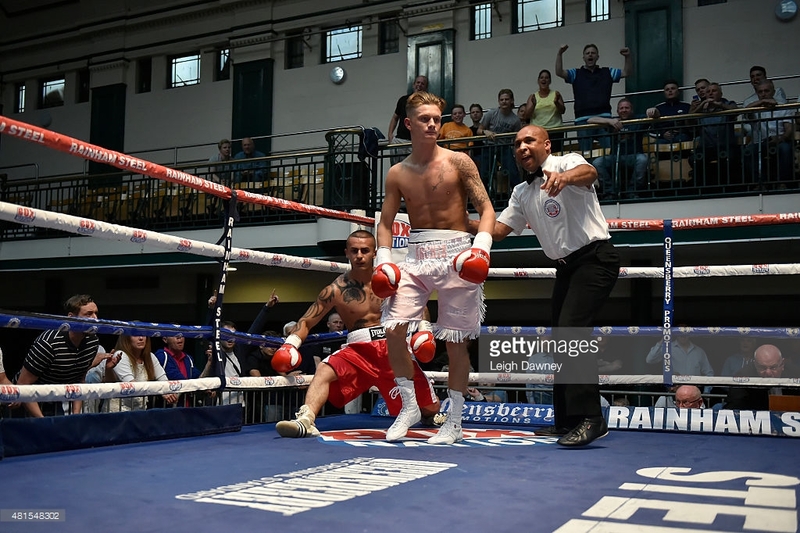 Welling Super-Featherweight Archie Sharp might just be the best kept secret in British boxing. The 22 year old ‘Sharpshooter’ went undefeated in his first 25 amateur bouts, conceded just once – on a double countback to a Russian in Russia in the European schoolboys final – in 22 starts in an international singlet and hoovered up nine national junior titles during a nine year innings in the unpaid sphere. And in his 11 fights since committing to a pro deal with Hall of Fame promoter Frank Warren in July 2015, the audaciously talented box-fighter has smashed six victims inside three rounds and registered ‘shutout’ points victories against the other five. Yet still he insists we haven’t witnessed his best side. ‘The higher I go, the more you’ll see my true ability, definitely,’ says the sleek 5ft 9in Chelsea fan. ‘When I spar class fighters like the Walsh brothers (champions Liam and Ryan) or Carl Frampton, I’m the clever fighter, in and out, working off the centre (of the ring). On best form, I can give ANYONE problems. ‘Presently, against these tough journeyman who just come to survive, I’m having to engage my opponents, be the aggressor, press forward. While I can box or trade, my best asset is that I’ve always been very, very clever. I’m a student of the sport, really clued up. ‘Profile wise I’ve probably fallen a bit behind your Zelfa Barretts and Lyon Woodstocks mainly because I don’t waste my time calling people out on social media. I leave them alone and they tend to leave me alone,’ claims Sidcup-born Sharp who has been coached by Richard Sawyer from the age of 11 and is managed by the MTK franchise in Marbella. ‘But I’m making big statements behind the scenes, in the gyms, with the top fighters and trainers, those whose opinions really matter. Let the others have smoke blown up their arses. ‘I’ve not seen that much of the others anyway. Zelfa’s ahead of me. He’s on the cusp of a British title challenge already. Woodstock was given a very tough night by Craig Poxton. You’ve also got Martin Ward and Joey Cordina; classy, classy operators. ‘Look they’re all great prospects but, when the fights are made, we’ll see who ‘The Main Man’ is. I’m still only 22 but I’m already a big superfeatherweight and there’s a lot more strength to come. ‘Don’t forget, in the amateurs I fought decorated international boys. Pat McCormack went the Olympics. His brother Luke did well at the Europeans (Under 22 champion). Calum French is a heck of a talent who has shone in the WSB….I beat them all. ‘I can throw and land shots the others won’t dream of throwing. I lost just five of 56 as an amateur and the only slip-ups came when I neglected my boxing and had a trade-up. On my A game, I can’t see any of ‘em beating me. The quick thinking, quick fisted starlet kickstarts his 2018 campaign in an eight rounder against an as yet unnamed opponent at the York Hall on February 24th. It will be his sixth pro outing at the iconic East End fight club. ‘The York Hall is such a historical venue which holds great memories for me. I should be pushing 200 tickets personally which will make for a good atmosphere as always, when I fight,’ states Archie who recently became a father for the first time. ‘What I bring to the show is class. Counterpunching. Hopefully, I’ll get an opponent who wants to work so fans can see me landing all sorts of lead uppercuts and check hooks, spinning my opponent through the ropes off the back foot. Elsewhere on a stacked card hard-hitting Southampton Super-Welterweight Joe Pigford returns to the ring after a brutal KO win over Aaron Morgan in May 2017; former Southern Area Super-Featherweight Champion Boy Jones Jnr fights at Lightweight for the first time; gifted Southampton Featherweight Ryan ‘The Piranha’ Garner looks to get his career back on track when he fights over four rounds; Ilford Welterweight talent Hamzah Sheeraz fights in his second professional contest; stylish Ilford Super-Middleweight Umar Sadiq and former Team GB Flyweight Harvey Horn both look to go 2-0 while Beckton Lightweight and Anthony Yarde gym mate Mohammed Bilal Ali makes his professional debut. Tickets for Saturday 24th February priced at £40, £50, £60 and £80 are available to purchase from www.ticketmaster.com and directly from fighters on the bill.